Effective Start Here pages make it easy for a new visitor to navigate your blog. A new visitor can use the information you include on your blog’s Start Here page to get up to speed on your content and to subscribe to your blog. When it comes to new visitors navigating your blog, you want them to magically understand exactly what your blog is all about, subscribe or follow the blog on social media, and start reading your content − in just one visit. With a Start Here as part of your blog design, you have a better chance of making that magic happen. Blog visitors often need a little extra guidance in navigating your site for the first time, even if you think your site describes itself through your design and content. Time is scarce, so the easier you make it for visitors to get a crystal clear picture of your blog, the more grateful they’ll be. A Start Here page tells your readers how they can benefit from your blog and highlights some of your best content to prove it. From a content standpoint, your Start Here page shouldn’t rehash your About page. Instead, focus mainly on your readers and describe who your blog is for and why they should read it. From a design standpoint, add images, subheadings, and bullets to improve the appearance and readability of the Start Here page. Although your About page may have covered some of your best content, the Start Here page uses your great content to convince the reader your blog is the place for them. Make that content visually interesting with thumbnails, images, graphical elements, or even a touch of color. Including a link on your About page to your Start Here page gets readers navigating to a place to learn even more specific information about your blog. A Start Here page doesn’t have to literally say Start Here, nor do you have to begin the page describing exactly what your blog is about. 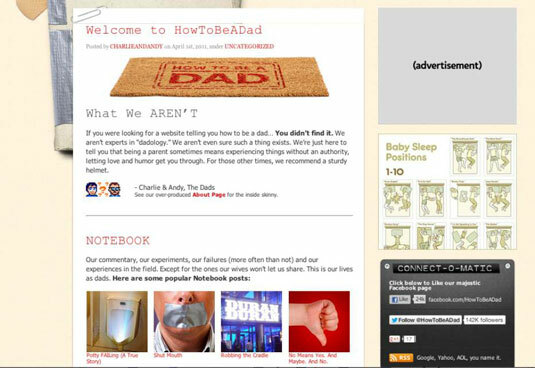 The blog How to Be a Dad calls this page the New Here? page. Bloggers Charlie and Andy start off by dispelling the idea that their blog is serious advice about how to be a dad. They make it clear from the start what their blog is not, and then feed visitors their best content. In addition, they visually show off their popular Notebook and Instructional Diagrams with a short section introduction, thumbnail images, and blog post titles to guide the reader to some of their best stuff. New readers navigate to your Start Here page because they want a course of action. Showing your best content should convince the reader whether your blog is the place for them. If they like what they see, the next logical step for the visitor is to take action by subscribing to your newsletter, signing up for a course, or following you in social media. Whichever action you want your visitor to take, make that section visually distinct from the rest of the page. The section should draw readers’ eyes straight to it so they can’t miss it. Distinguish your call-to-action section by using a different color or different design element not used elsewhere on the page. Within that design element, stick to a simple action statement, which is easier to digest than a wordy one. 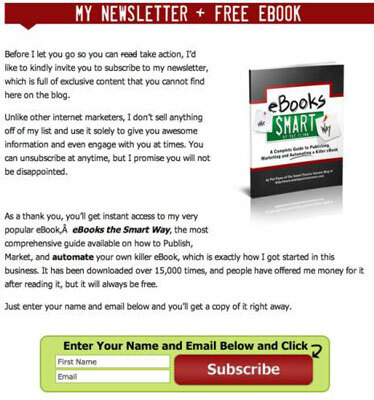 The last section of the Smart Passive Income blog’s Getting Started page uses the same section design as the rest of this page but grabs attention with a product image (that’s free!) and a to-the-point subscription box.